We have brought you the coolest places to stay right now. So thank us later, but firstly, get booking and packing, because you won’t want to miss out on these hot spots. 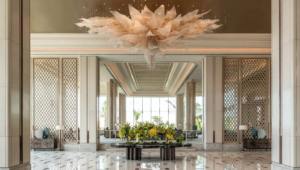 Conceived by coveted French designer Pierre-Yves Rochon, Waldorf Astoria’s latest location is opulence at every angle, starting with the double-height, three-tiered lobby — all Lalique crystal, Italian marble, 22-carat gold leaf, and glossy cherry wood. Its rooms and suites are of course just as over-the-top, boasting floor-to-ceiling windows, and your own private balcony that looks out to breathtaking views of the Hollywood Hills. For dining, the restaurant’s chef is non other than New York’s finest Jean-Georges Vongerichten. Wherever you stay, the Shangri-La oozes the vibe and energy of its location, and this latest arrival to Colombo is currently the top of every blogger’s bucket list. Ocean views for days, fresh dishes based on local food, a hip bar with great vibes, it doesn’t get better. 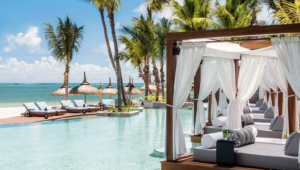 As one of Mauritius’ most iconic hotels, One&Only Le Saint Geran features 142 colonial-style ocean-view rooms offering a stay of pure relaxation. It’s newly renovated world-renowned spa, offers new treatments that are available nowhere else in the country. There are five restaurants, our favorite being L’Artisan, an all-day bakery where the most delicious, freshly baked sugary treats awaits. The beaches are just divine, with crystal waters and soft white sand, just inches from the hotel. If you love water sports, there are a plethora of enticing options to fill up your day, or entertain the kids.